Thanksgiving is about family get-togethers and good food. This Thanksgiving, you might try a traditional Schmidt family recipe or two! And while you’re at it, submit your own family recipes to the Schmidt Cookbook! Directions: Mix bread crumbs and broth together. Add the egg and mix together. Add cooked chicken, sage, salt, pepper, onion and celery and mix well. Bake covered for one hour at 350 degrees. Bake uncovered for 10 minutes. Quick and easy. Directions: Dredge the cutlets in flour. Mix the 2 eggs and ½ cup water and beat with the salt and pepper. Dip the cutlets into the egg mixture and roll in the crumbs. (For the crumbs, I use stove top dressing ground finely in my food processor.) Melt the butter or margarine in a large heavy skillet on medium heat for 2 or 3 minutes according to your thickness (per side). Yields 4 servings. 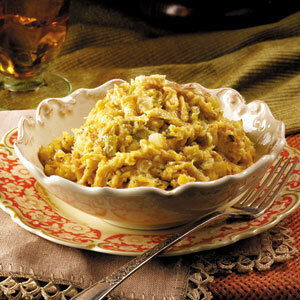 Suggested sides: Spaetzle, sauerkraut with caraway seeds, buttered sweet corn, applesauce, or baked beans. Melt margarine, cook carrots and onion until tender. Add soup, broth, parsley and hot sauce. Cook and stir until just boiling. Reduce heat, cover and simmer 20-25 minutes. Stir occasionally. Stir in cheese, bacon, and evaporated milk. Do not boil. Cake Directions: Combine eggs, sugar, and oil. Mix well with mixer. Add flour, baking soda, salt, and cinnamon. Mix by hand until moistened. Stir in apples and nuts. Bake in 350 degree oven for 1 hour. Frosting Directions: Beat the cream cheese with the milk, powdered sugar, and lemon peel or vanilla. Spread over the cake. Directions: Combine ingredients in Corningware coffee pot. Simmer. Serves 6. Thank You to Joyce and William Green!